Call Flue Steam for thorough, professional exhaust duct cleaning in Simi Valley CA. How long has it been since your last exhaust duct cleaning? If you can’t recall, you may be putting your kitchen at risk of a grease fire in the exhaust system or at very least a fire code violation. To eliminate fire hazards, ensure code compliance, and restore your peace of mind, call Flue Steam. 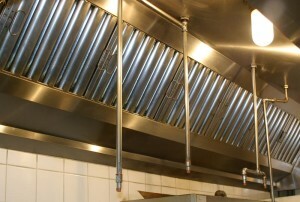 We can provide the professional exhaust duct cleaning in Simi Valley CA you need to keep your kitchen safe. We have a 40-year history of excellence in this industry, and you can be confident that our professional, certified exhaust duct cleaning technicians will keep your ducts up to our high standards of cleanliness. By combining the two types of exhaust duct cleaning in Simi Valley CA that we offer at Flue Steam, you can achieve the clean you need in the most cost-effective manner possible. Many companies that provide exhaust duct cleaning in Simi Valley CA expect you to take their word for it when they say the ducts are dirty enough to require a cleaning as well as when they say the cleaning is complete. At Flue Steam, our technicians use a special tool to measure grease accumulation before and after cleaning, to prove to you that the cleaning was necessary for fire prevention reasons and effective in reducing grease down to a safe level. Taking these measurements also helps us adjust the frequency of your cleanings to ensure you don’t waste money on cleanings before they are actually needed for safety or code compliance. Are you ready to start trusting real pros with your exhaust duct cleaning in Simi Valley CA? All you have to do is call or click. We’ll make sure you get your service at a time that’s convenient for you.